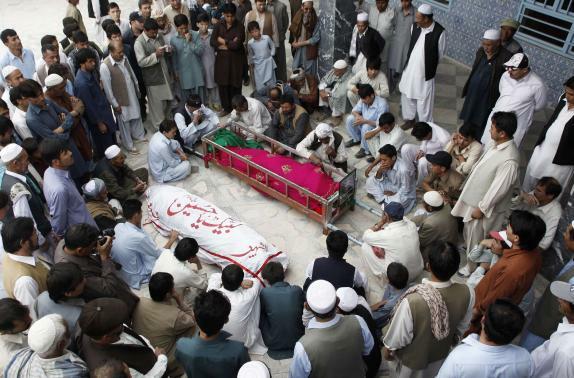 (Reuters) – Eight Shi’ite members of Pakistan’s ethnic Hazara minority were killed and one wounded on Thursday, after gunmen opened fire on a bus in the volatile province of Baluchistan, police said. No one immediately claimed responsibility. Lashkar-e-Jhangvi, a radical Sunni militant group, has carried out many gun and bomb attacks on Hazaras in the past. The men were returning from a vegetable market when gunmen intercepted the bus. “Two gunmen boarded the bus and shot the men,” police officer Imran Qureshi told Reuters. All the victims were Shi’ite Hazaras, said Asad Raza, another senior police officer. Television stations broadcast images of the bus surrounded by security officials after the attack.